In June 2012, the Bomber Command Memorial was dedicated in London. Those present witnessed 55,573 poppies tumbling from a Lancaster, one for every Bomber Command man killed during the war. Peter Rees mingled with the 106 Australian survivors who attended that significant and moving event. Just as the poppies symbolised the souls of those lost to Bomber Command operations, Lancaster Men. The Aussie Heroes of Bomber Command represents the collective experiences of the Australians who fought, survived and died in the RAF’s bomber war. Rollo Kingsford-Smith, Jack Davenport, Noel Eliot, Jim Rowland, Jack Mitchell, Mickey Martin, Alick Roberts, Blue Connelly, and Ted Pickerd are just a handful of the men who appear in this fine account. Peter follows the general course of the war and covers the full gamut of their wartime episodes. Pathfinders, Dambusters, Great Escapers are included and even Q for Queenie’s harbour bridge stunt gets a mention. He discusses the bombing of Dresden, long considered the darkest moment of the bombing campaign, and places it in a new perspective. He includes historical commentary where appropriate, but the personal stories are the heart of his book. Jack Mitchell’s story for instance, encapsulates the wartime experience of many. ‘I wonder if this [a stick he ‘planted’ on Tasmania’s Sugarloaf] will be here when I come home’. Some subjects, like Ted and Rollo appear and reappear during the course of the war. Others only appear once, illustrating one aspect of the vast Bomber Command experience. Peter shows the readers how close these men became in their shared experience and commitment to bringing the war to the enemy. Their dedication to their fellow aircrew was exemplary. Take, for example Rawdon Middleton’s heroic last flight, for which he was awarded the Victoria Cross, or the dramatic night when Geoff Smith gave up his usual position of mid-upper gunner to a young chap on his first op. Now, there is a tale. When their Lancaster was hit, the new boy’s turret was put out of action and his leg was broken. Even so, he managed to crawl from the turret to beat out an oil fire with his helmet. Then he tried to make it to the pilot to tell him of the damage. He was found unconscious by the wireless operator. Geoff Smith, in the rear turret that night, had also been injured. His leg was shattered but he refused to leave his position; with the mid-upper gunner and turret out of commission, he was the Lanc’s only defence. In the cockpit, with instruments all but useless, the pilot skilfully evaded enemy AA and nursed the crippled bomber home. He was unable to make a normal landing because the bomb bay doors were wrecked; he had to belly land on a damaged undercarriage. If the selflessness of Geoff and the young mid-upper gunner were not enough, here is another incredible demonstration of the strong ties of this crew. The bomb aimer and the wireless operator lay down beside Geoff to protect him in case they crashed. The only blemish in this beautiful and remarkable testament to both courage and friendship is that the other gallant men in this crew are not named. That flaw aside, this is simple, restrained yet powerful storytelling at its best. 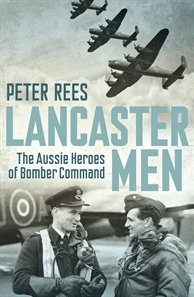 I had the pleasure of reading and commenting on an early draft of this book and was disappointed to hear that Peter’s original title, All the Fine Young Men, had been rejected by Allen & Unwin, who decided it should be called Lancaster Men. Catchier title perhaps, but this book is not only about those who flew the mighty Lanc. Peter’s fine men also flew Hampdens, Whitleys, Stirlings, Manchesters and Wellingtons. In excluding those who flew other aircraft from the title, the marketers have somehow diminished their experience. If the marketers got it wrong, Peter certainly got it right. As demonstrated in The Other Anzacs: Nurses at War, 1914–1918 and Desert Boys. Australians at War from Beersheba to Tobruk and El Alamein, Peter is a natural story teller with a gift for dealing with multiple stories. He competently weaves them into a moving and dramatic narrative, all within the general chronology of the war. The text is supported by a good selection of photos, many supplied by the families of his key subjects, two decent maps, a useful index, notes and bibliography, and great cover art. I enjoyed this very much. It is unputdownable. A first-rate testament to all of Australia’s fine men who flew Stirlings, Wellingtons, Lancasters and the rest. Highly recommended.